The Sound Blaster crew has some crazy ideas about how we should listen to music. Imagine how cool it would be if the next time you bought an album from your favorite artist, it came with a small file that reprogrammed your audio system—with your permission, of course—so that the music sounded as good as the artist thought possible on that particular audio system? Creative says it can be done today with its new iRadio Bluetooth speaker. The iRoar might resemble other portable Bluetooth speakers, but that’s where the similarity ends. The iRoar covers all the bases, with support for the aptX, aptX low-latency, AAC codecs, and SBC codecs for wireless streaming. And it supports NFC for quick-and-easy pairing with your smartphone or digital media player—just touch your device to the top of the iRoar’s cabinet and you’re ready to play music. Also on top of the cabinet? Contextually aware capacitive touch controls for customization and personalization. Inside the cabinet? The guts of Creative’s most powerful Sound Blaster sound card. 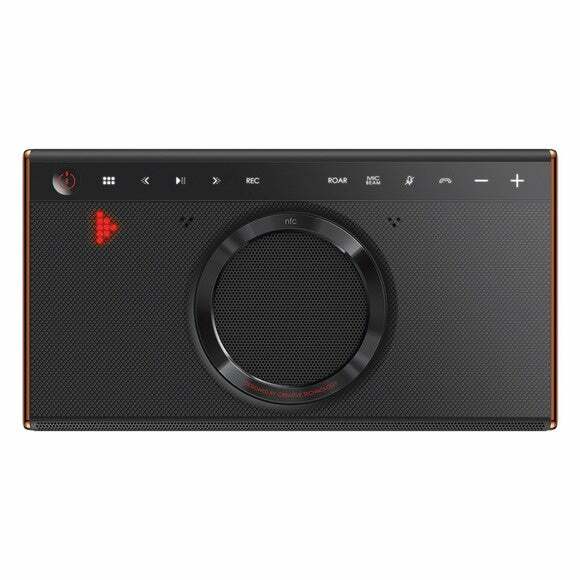 The iRoar is outfitted with the same programmable, multi-core floating point SB-Axx1 processor that Creative plants in its Sound Blaster sound cards. This chip handles all the audio and effects processing, but Creative has also created a software development kit that allows a recording artist to provide fans with a small file that can customize the powered speaker’s attributes and performance at the hardware level. Weighing just 2.5lbs, the iRoar is intended to function as a portable speaker with an estimated 20-hour battery life. 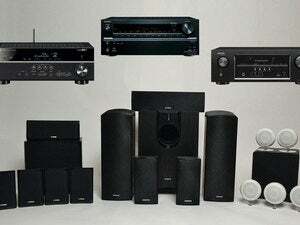 In Bluetooth speaker systems, portability has usually meant compromised audio quality. On paper at least, the iRoar looks to buck that trend. The enclosure houses dual two-inch drivers up front to handle high and mid-range frequencies, and there’s a 2.75-inch woofer to handle the lows. This driver is supplemented by dual passive radiators on the side of the speaker. The iRoar, shown here docked to an optional subwoofer at Creative's booth at CES 2016. One amplifier is dedicated to the left and right stereo channels, and a second amp handles the bass (the amps deliver more than 40 watts combined, which is impressive for a system this small). Creative didn’t disclose everything in its spec sheet, but we can assume there’s a Class D amplifier at work, given the size of the unit. Also atypical of Bluetooth speakers are the iRoar’s extensive connectivity options: There’s the usual 3.5mm analog line-in, but there is also a dedicated micro-USB Audio input, a MicroSD card slot, a TOSlink Optical input, and a standard USB female 1.5A port for charging the onboard battery. That optical port is just the ticket for connecting the iRoar to your TV and using it like a tiny sound bar. Craving more bass? 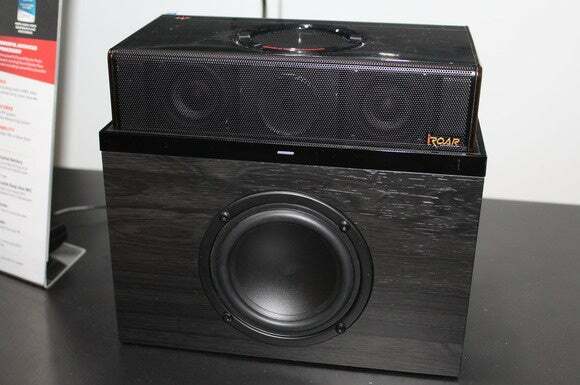 A docking port on the bottom of the speaker lets you set an iRoar on top of a powered subwoofer. Now connect two iRoars together using Creative’s intelligent Mega Stereo Cable, and you have a 2.1-channel system. Creative has cooked up an open Docking Development Kit (DDK) and will allow third parties to create other types of hardware devices that can take advantage of its docking port. Creative itself has already built an iRoar Voice Projector mic that will turn the iRoar into an ultra-portable personal PA system. The iRoar’s major differentiation with other Bluetooth speakers lies in how Creative has positioned the unit as a feature-rich platform that can be customized and expanded. Users can customize their listening experience by using DSP settings like Live Concert, Audiophile Bliss, Game On, Sonic Bass, Cinemania, or personalized preferences. Creative has a Software Development Kit (SDK) for the iRoar that they hope will lead to various professional, industrial, personal and educational uses. iThere’s an iOS and Android app for the iRoar. Firmware updates happen over-the-air via the app. The iRoar Dashboard app comes with a range of teaser add-ons to inspire developers to create their own solutions. Some of the teaser apps are fun and gimmicky and some show real potential. For example, there are over 20 add-ons that allow the iRoar to function as an alarm clock, a music timer, a metronome, a speakerphone for teleconferencing, a pseudo alarm that will go off when motion is detected, a jukebox, pedometer, and a voice lab that will make your voice sound like you’ve inhaled different gases. The iRoar is available now for $370. Stay tuned for our hands-on review. With additional reporting from Michael Brown.